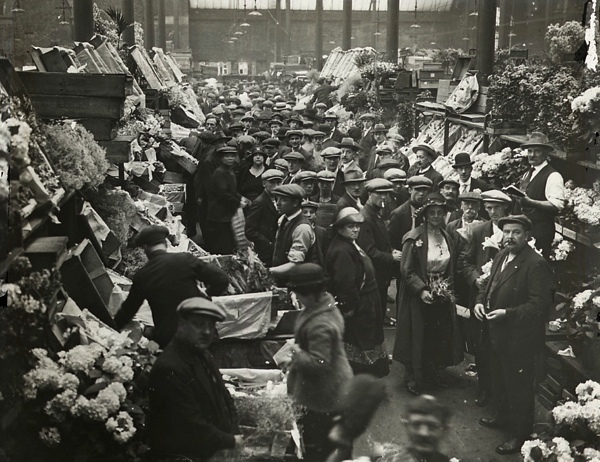 As part of the CRIES OF LONDON season I have devised for Bishopsgate Institute, we are staging three CHIT-CHATS in November with traders from Billingsgate, Smithfield & New Spitalfields sharing stories of market life. Click here to sign up – tickets are free but numbers are limited. 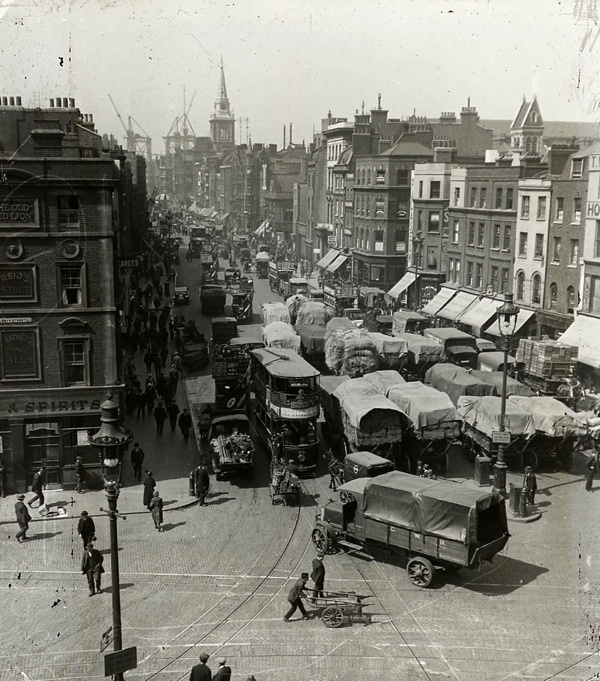 I never knew there was a picture of the legendary and long-vanished Clare Market – where Joseph Grimaldi was born – until I came upon this old glass slide among many thousands in the collection of the London & Middlesex Archaeological Society, housed at the Bishopsgate Institute. 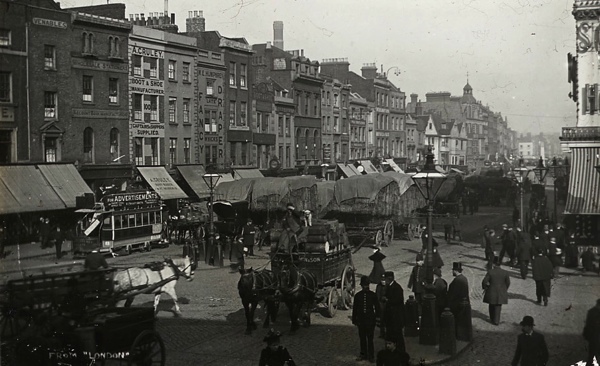 Scrutinising this picture, the market does not feel remote at all, as if I could take a stroll over there to Holborn in person as easily as I can browse the details of the photograph. 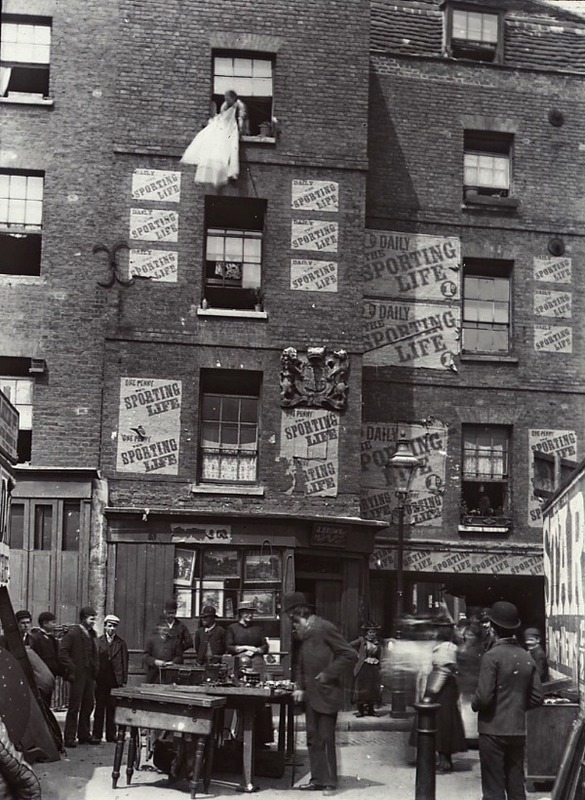 Yet the Clare Market slum, as it became known, was swept away in 1905 to create the grand civic gestures of Kingsway and Aldwych. 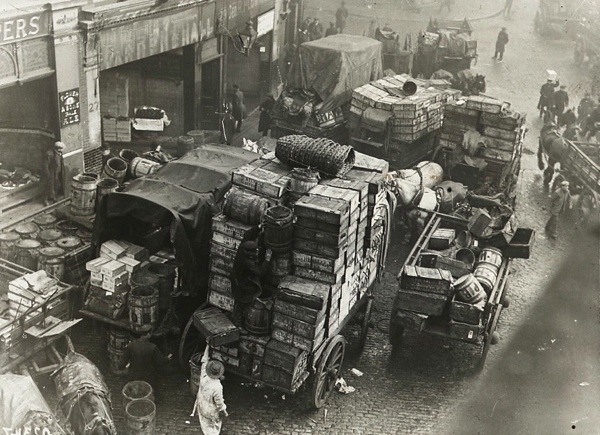 Searching through this curious collection of glass slides, left-overs from the days of educational magic lantern shows – comprising many multiple shots of famous landmarks and grim old church interiors – I was able to piece together this set of evocative photographs portraying the markets of old London. 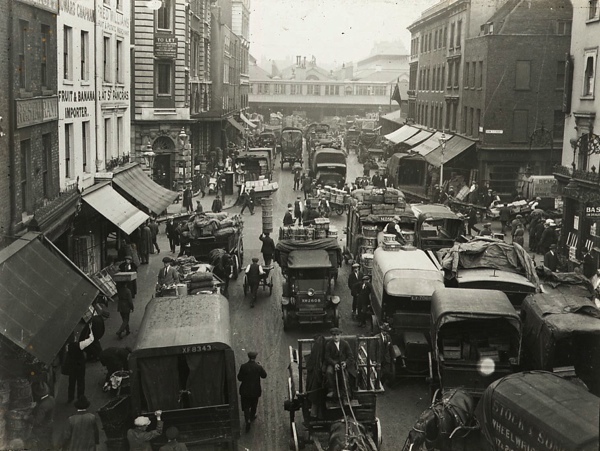 Of those included here only Smithfield, London’s oldest wholesale market, continues trading from the same building, though Leather Lane, Hoxton Market and East St Market still operate as street markets, but Clare Market, Whitechapel Hay Market and the Caledonian Rd Market have gone forever. 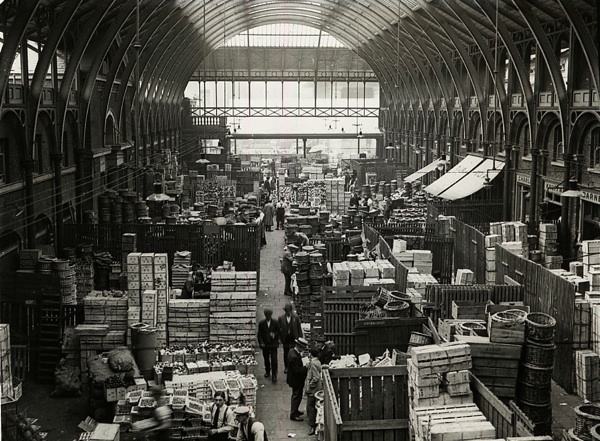 Meanwhile, Billingsgate, Covent Garden and Spitalfields Fruit & Vegetable Market have moved to new premises, and Leadenhall retains just one butcher selling fowl, once the stock-in-trade of all the shops in this former cathedral of poultry. 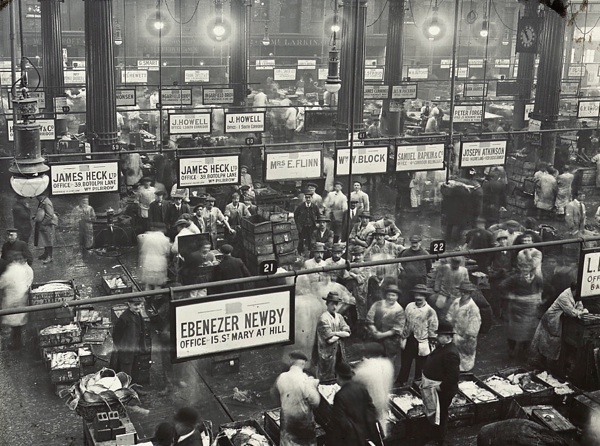 Markets fascinate me as theatres of commercial and cultural endeavour in which a myriad strands of human activity meet. 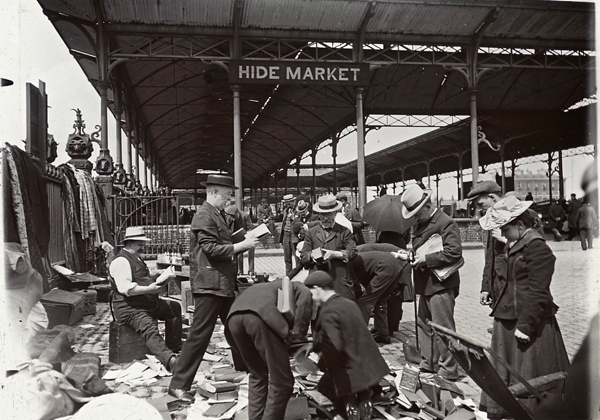 If you are seeking life, there is no better place to look than in a market. Wherever I travelled, I always visited the markets, the black-markets of Moscow in 1991, the junk markets of Beijing in 1999, the Chelsea Market in Manhattan, the central market in Havana, the street markets of Rio, the farmers’ markets of Transylvania and the flea market in Tblisi – where, memorably, I bought a sixteenth century silver Dutch sixpence and then absent-mindedly gave it away to a beggar by mistake ten minutes later. I often wonder if he cast the rare coin away in disgust or not. 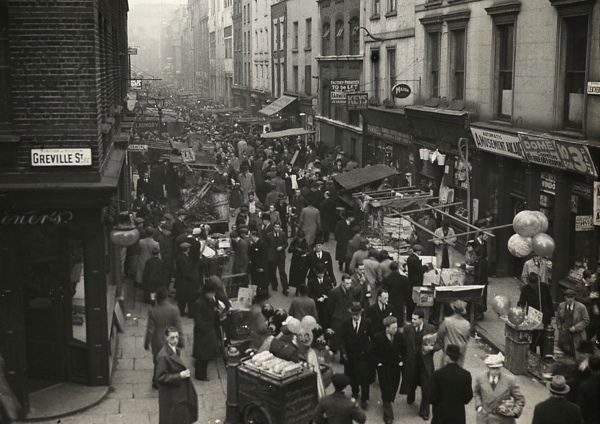 Similarly in London, I cannot resist markets as places where society becomes public performance, each one with its own social code, language, and collective personality – depending upon the nature of the merchandise, the location, the time of day and the amount of money changing hands. 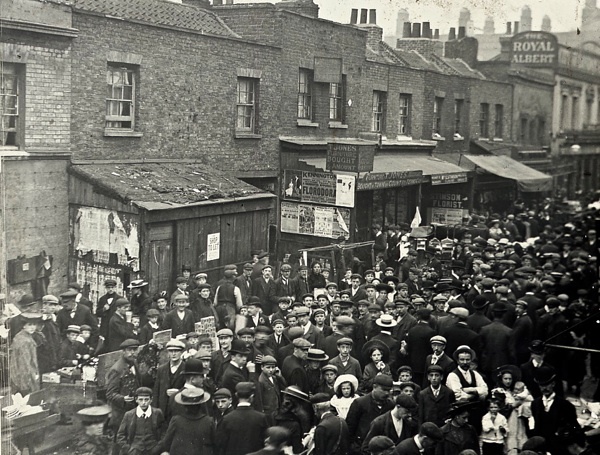 Living in Spitalfields, the presence of the markets defines the quickening atmosphere through the week, from the Thursday antiques market to the Brick Lane traders, fly-pitchers and flower market in Bethnal Green every Sunday. I am always seduced by the sense of infinite possibility when I enter a market, which makes it a great delight to live surrounded by markets. 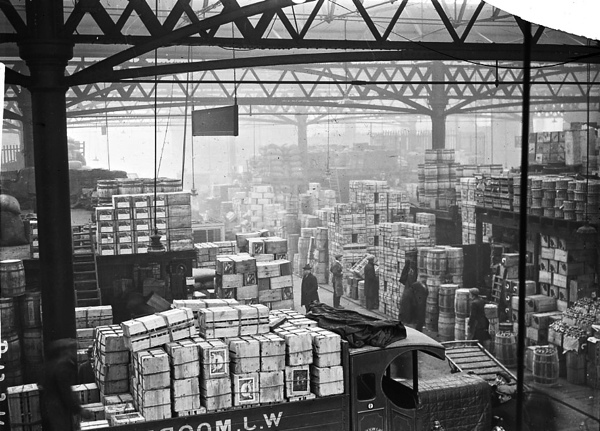 These old glass slides, many of a hundred years ago, capture the mass spectacle of purposeful activity that markets offer and the sense of self-respect of those – especially porters – for whom the market was their life, winning status within an elaborate hierarchy that had evolved over centuries. 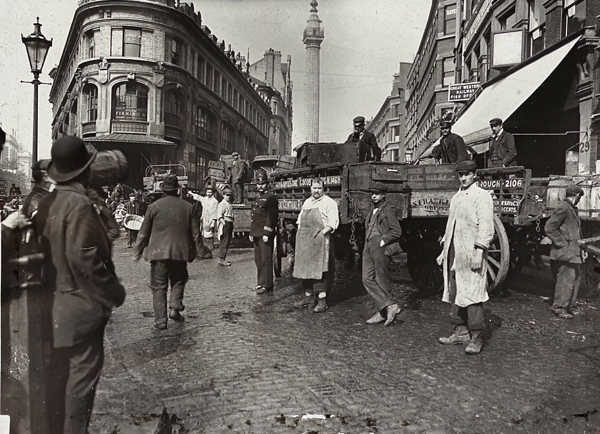 Nowadays, the term “marketplace” is sometimes reduced to mean mere economic transaction, but these photographs reveal that in London it has always meant so much more. I think it’s fair to say that markets have always had a somewhat “dubious” reputation with a lot of people as places where “dodgy deals” and unscrupulous characters are out to “fleece” any unsuspecting victim they can, as a long standing trader myself I would be the first to admit that this may be true on some occasions for as in any walk of life there will always be some crooks who let the side down (such as in the HOUSE OF COMMONS for example ) but as a general rule and speaking from a lot of experience I can say in all honesty that by far the majority of traders you find in a market are pretty decent people, working hard to make in a lot of cases a very modest living, as a trader myself I like to think that markets, and street markets in particular are very much a true haven of genuine equality in our society, you will always find people from every sector of life in a market, rich, poor, young and old, side by side, and regardless of who you are or where you come from, as a customer you will ALL be equal, as a trader you will all be different, but with a common purpose, to work hard, to serve the public in a way that will make them want to come back and of course to hopefully earn a living, luckily for me, East London is an area with a long and rich history of street markets and even now in 2015 in the East End you are never more than walking distance from a market on any day of the week, but regardless of where you are, if you visit markets then please continue to do so because we very much need your support, but if you never go to markets then why not start, or at least give it a try, you might just be pleasantly surprised at what you find. 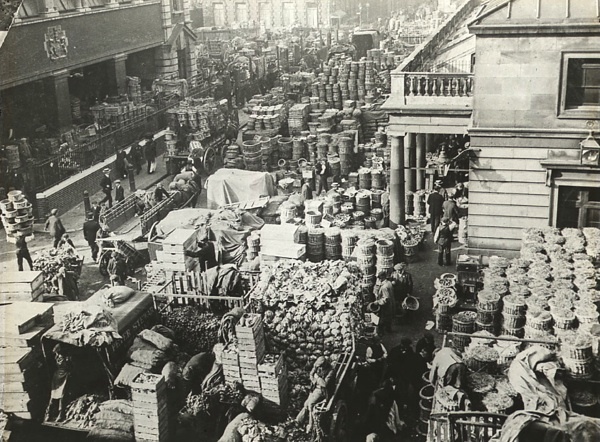 Oh how great to see the London markets, many of which I worked or lived near. 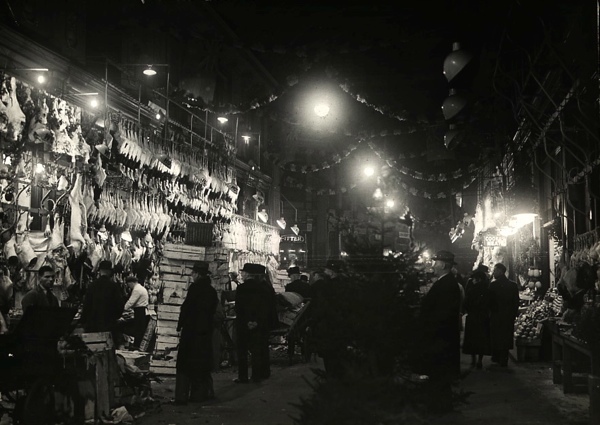 Growing up I was a regular shopper at East Street market and danced amongst the meat hooks of Smithfields market to the Syd Lawrence Orchestra and George Melly when Bart’s Hospital held a Ball back in the 1970s. Happy memories. 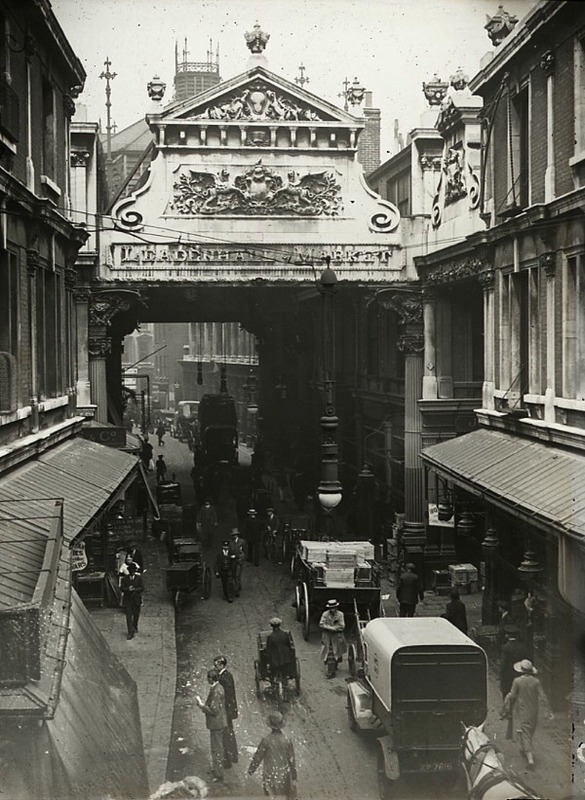 Working on unpublished diaries (70 years of them) I found that Leadenhall Market sold live foxes in the 19th Century. There was certainly a shortage of them in southern England and these were brought in from the Continent and bought by hunts to stock their areas. Apparently some wolf cubs were also included! Am I the only person who pores over these photos with a magnifying glass? Wonderful images. Those taken in 1910 make me sad because four years later a lot of the young men/boys we see in the photos would be off to war, many never to return. 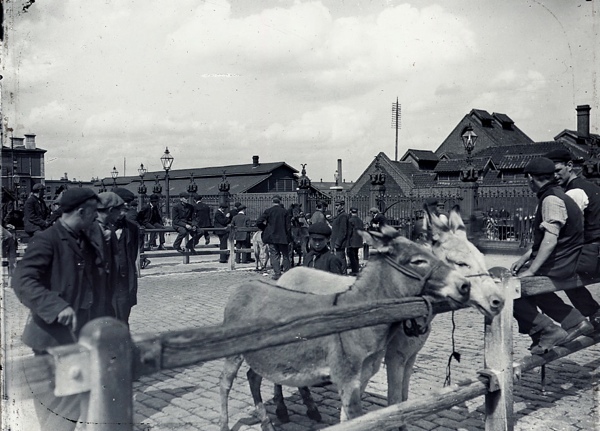 Wonderful photos from a vanished world. 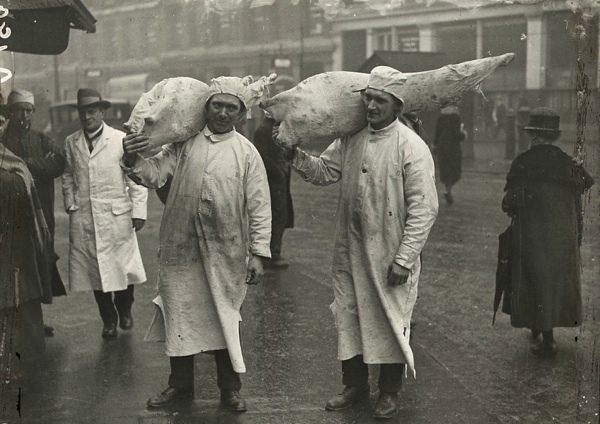 I remember the Joys of the Smithfield Market atmosphere where my Uncle Ted was a Meat Porter. 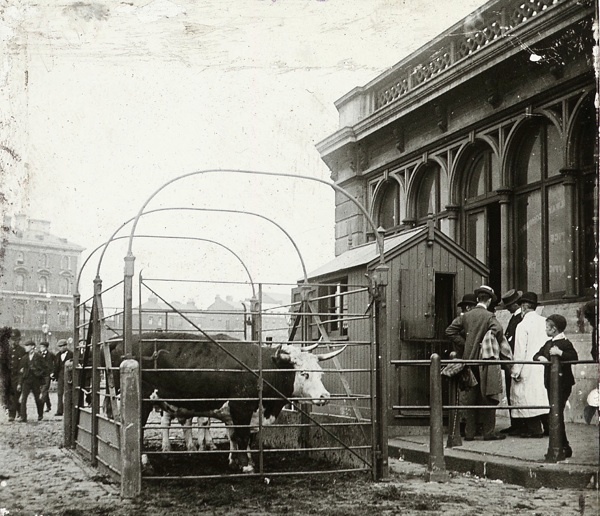 Caledonian Road was a vast slaughterhouse stinking up the Area and making the Cally an awful place to visit and worse to live in. Wonderful photos – absolutely fascinating! Thanks for sharing. 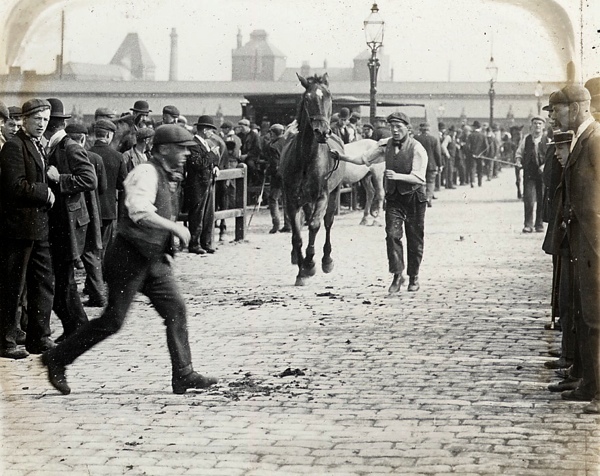 I imagine that the photo of the Smithfield porters is nearer 1920, judging by the dress of the woman in the background. Now, thats what i call a hive of activity! 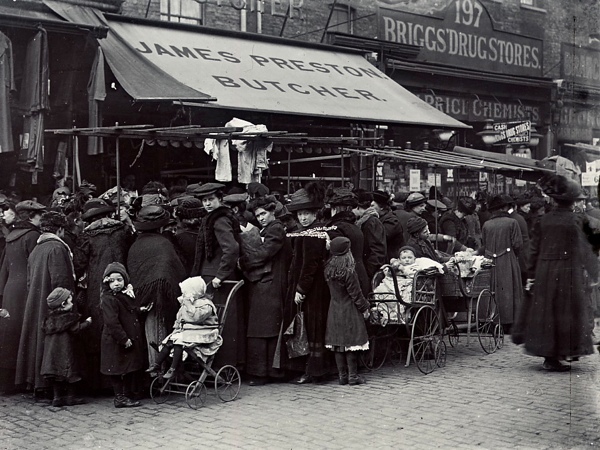 Wonderful market photos. Thank you.